The following FAQ will run you through receiving bottled stock into your winery and having them show correctly on your TTB reports. This FAQ assumes you have the inventory module enabled, if not contact support for more information. Clicking on the images will open a new page containing the full sized image for you. To start with we will need a bulk wine stock item for the bottles. If the wine or batch/lot has existed in vintrace before then you already have one, if not use the following steps to create it. Open up the file menu and select the New Batch option. You will need to fill out the appropriate batch/lot code for the wine in bottle, the owner of the batch/lot and the production year. After you save the new batch it will automatically create a bulk wine stock item for you which you can use later when receiving the bottles. Next we’ll need to head into the Inventory -> Receive screen. 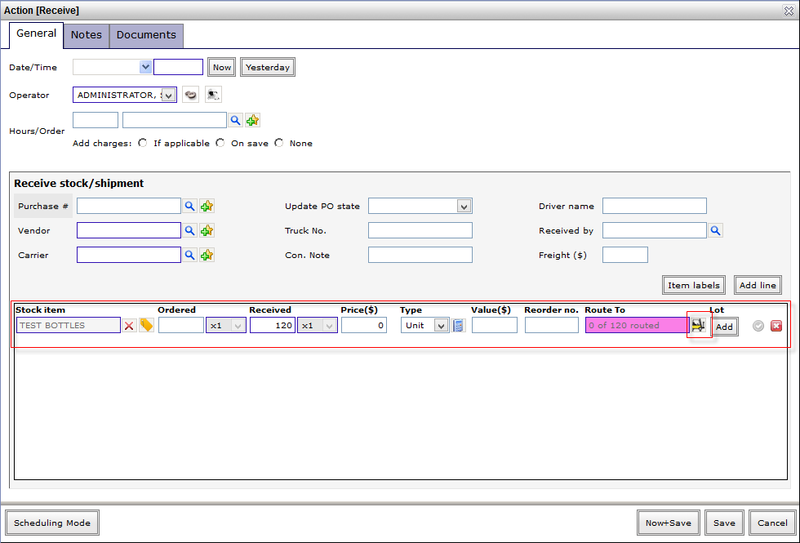 If you already have the bottle or case defined in the system you can enter the stock code into the stock code field. If not you can press the little plus star icon to create a new stock item. Pressing the plus star icon will ask you what stock type you want to create, select single x1 or any of the case x categories. 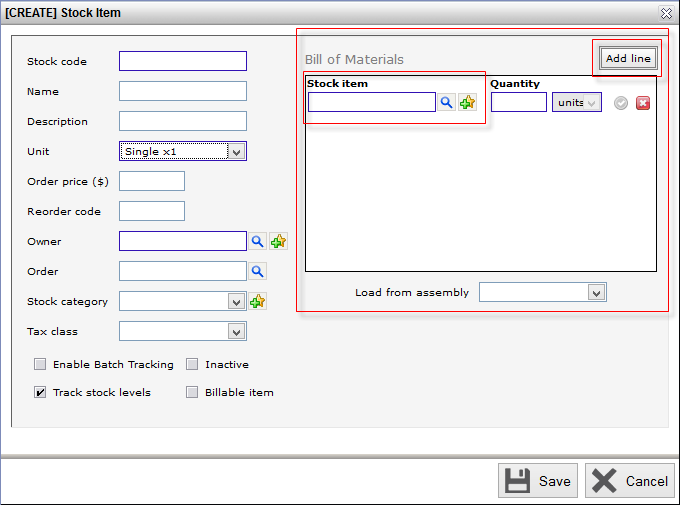 After selecting a category you’ll be taken to the stock item creation screen. 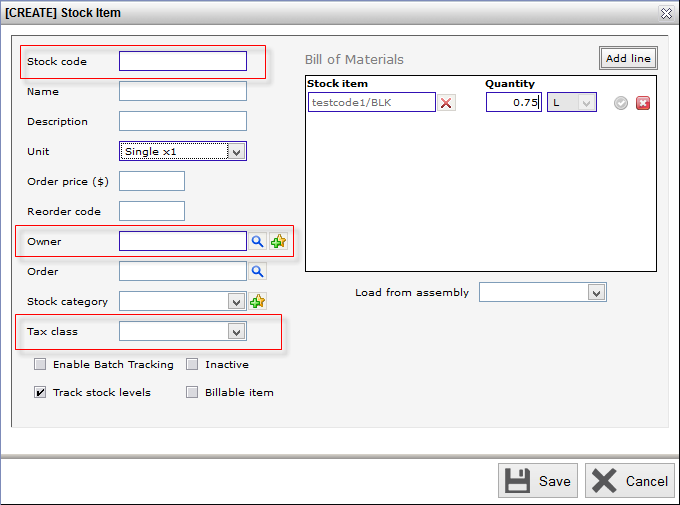 On the right hand side is the bill of materials, press the add line button to add a new line item to the bill of materials. In the stock item field enter in the batch code you created earlier and add a /BLK to the end of it then press the magnifying glass to search for it. 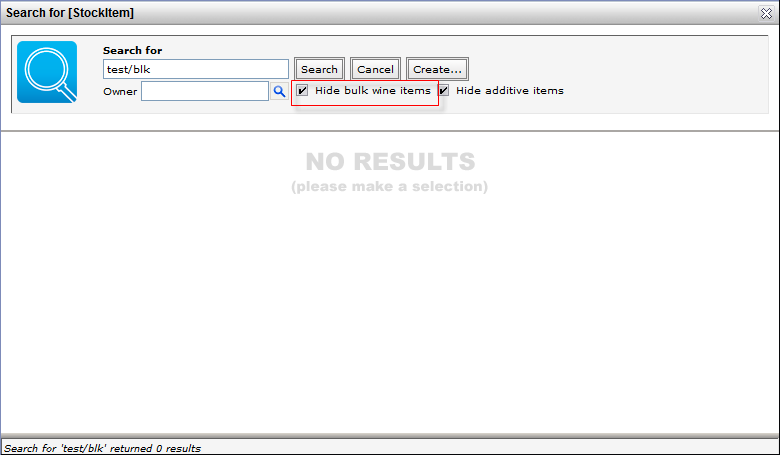 Initially this won’t return any results, you’ll need to uncheck the ‘Hide bulk wine items’ box and then the search will find it for you and lock it in. After the bulk wine item is locked into the bill of materials you’ll need to enter the quantity of wine contained in this stock item, eg 0.75 litres for a bottle or 9 litres for a case of 12. 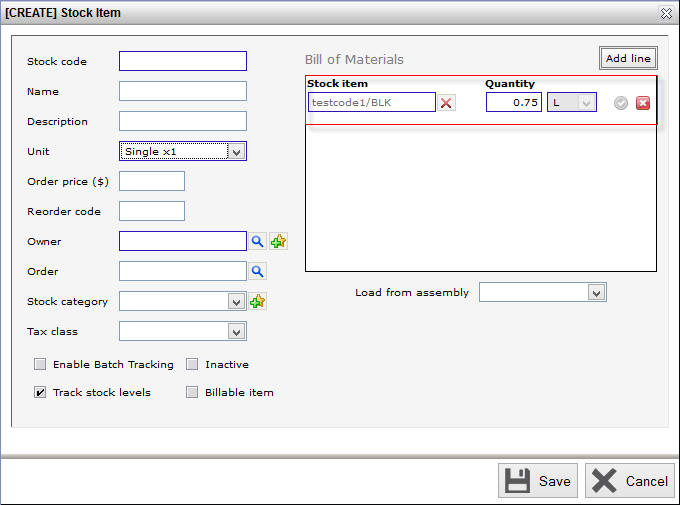 After the bulk wine is configured you can then add any other line items you like to the bill of materials, for example glass, labels, and corks. Now that the bill of materials is set up you can give the bottled wine a name via the stock code and name fields, set the owner and set the tax class. The tax class is important if you bring the wine into a bonded storage area so make sure to have it set to avoid TTB reporting issues. 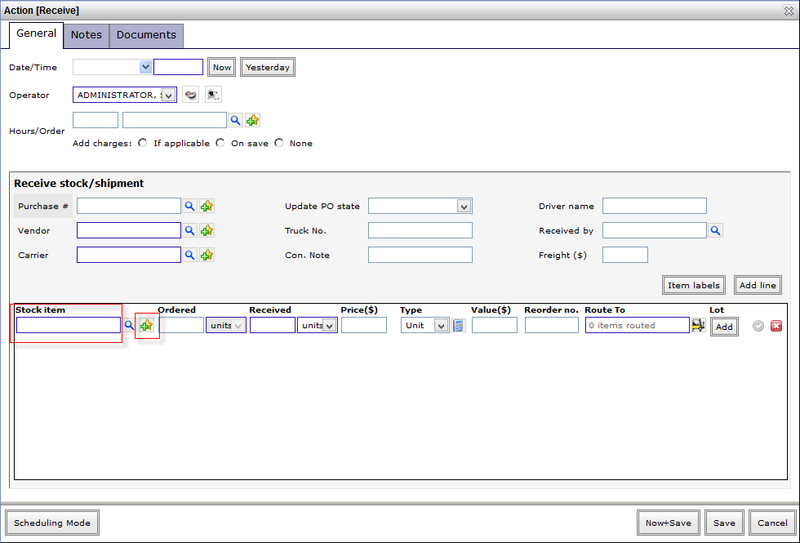 If you would like to track the received bottled wine in stock lots you can also enable batch tracking, this enforces the use of stock lots on the stock item. When done press save, this will automatically lock the new bottle item into the receive screen for you. Enter the amount you are receiving then press enter or click anywhere else, this will update the stock routing information for you and probably turn it purple. Click the forklift icon to tell the system where you would like to put the bottles. 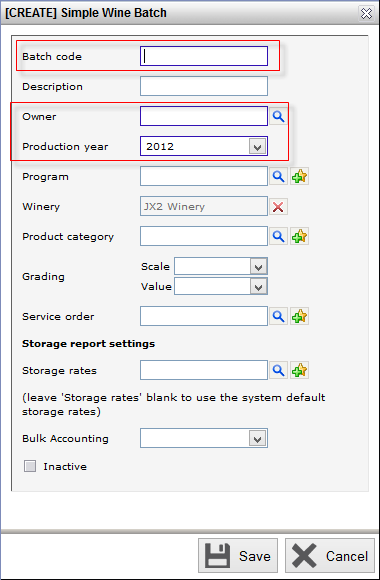 On the stock routing screen you’ll need to select the storage area, there are two types of storage areas in vintrace and depending on where the stock is received to it may effect your TTB report. If the stock is received into a Bonded storage area the system will mark it as received in bond on the bottling section under the tax class set earlier. If the stock is received into a tax paid storage area the system will ignore it for TTB purposes until it is moved into a bonded area. 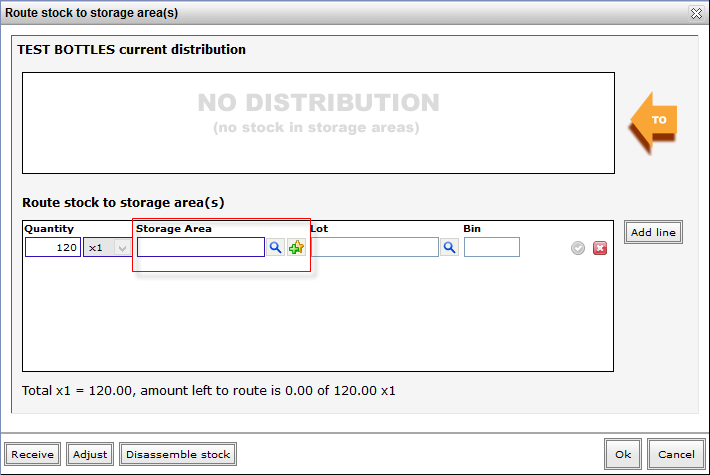 After the storage area is selected you can press OK to update the stock routing information. You can now fill out the rest of the receive information, and when saved your new bottled goods will be received into the system. If you get stuck on anything or have trouble receiving the stock into vintrace feel free to contact support and we’ll do our best to help.